My brother, Jason, returned to co-host once more in episode #002 of Horrorlust Radio. In the second episode of Horrorlust Radio, Jason and I discuss the evolution of horror in video games and also delve into the sometimes blurred line between extreme haunted houses and abduction simulations. This episode also features the debut of two new segments — Nightmare Fuel and Serious Celluloid. In Nightmare Fuel, Jason recounts a personal account of an unidentified flying object he once witnessed in August 1997 and in Serious Celluloid I recommend a horror film to listeners. We also discuss some of our earliest visits to haunted attractions — most notably a legendary trip through Lincoln Park’s Anxiety Alley and and eye-popping jaunt through a Monroe Jaycees haunted house during the mid-90’s. More show notes and additional description information to follow. 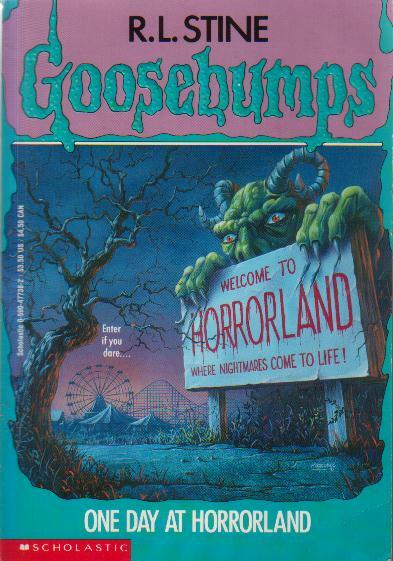 One Day at Horrorland was book #16 in the original Goosebumps series and was released in February 1994. It’s among one of my favorite in the entire series and remains one of the most popular Goosebumps books. 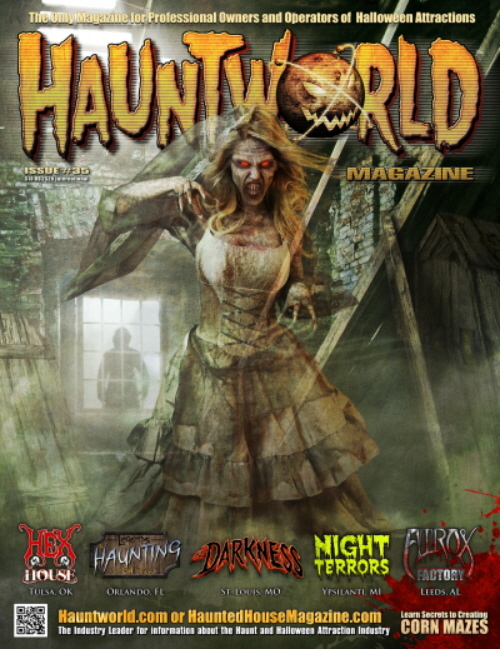 The HauntWorld Issue #37 article I referenced in our conversation about extreme haunted houses and abduction simulations was titled Abduction Simulations: The Coming Plague and was written by Ben Armstrong of Netherworld Haunted House. Consummate the marriage? I’ll pass! I found the latest issue of HauntWorld Magazine inside my mail box last week and after reading it, I thought it high time to interact with all of you wonderful creeps once more. If you want a little nostalgic eye candy, check out the Fright Props ad on page 5. The artwork and humor are reminiscent of that found in EC Comics; it’s spooky fun and very colorful. Issue #35 featured articles on five haunted attractions — Hex House, Atrox Factory, Legends: A Haunting at Old Town, The Darkness, and Wiard’s Orchards’ Night Terrors. I found the articles on Legends: A Haunting at Old Town and Wiard’s Orchards’ Night Terrors of particular interest. Legends is based in Kissimmee, Florida and is open to guests not only during the Halloween season, but indeed the entire calendar year. Every Tuesday through Sunday the ghouls prowl the halls of Ashdown and Son’s Undertakers and any warm body willing to pay the price of admission can get themselves a scare. That kind of flexibility is a crucial element to the success of haunted attractions. I’ve witnessed first hand how this strategy can positively impact the overall quality of a show. Actors should be granted the freedom to roam and to adapt their performance for different guests. Do you want your cast to unleash its full potential? Then provide the ultimate canvas onto which their nightmarish vision can best be painted. The best firsthand example I have witnessed was the team at Sinister in Utica. During a visit there last fall I had the opportunity to talk to the owner/operator at length and he explained that this was something on which he placed a strong emphasis. There simply aren’t many major haunted attractions that we haven’t visited in Michigan, but Wiard’s Orchards’ Night Terrors is one such location. Despite six attractions and an eye-catching ad in the Fear Finder, a combination of a mixed reviews and a hefty admission have kept me from penciling in Wiard’s for a visit. However, after reading the current HauntWorld feature, it may be time to reconsider. Wiard’s first opened their marquee attraction, the Ultimate Haunted Barn in 1984, which according to HauntWorld is the oldest known barn haunt in the United States! 2014 will mark the establishment’s 30th anniversary, a fact that singularly suggests that the operators must be doing something right. My interest is officially peaked and I’ll certainly do some research in preparation for a possible trip this fall. When I checked the mail yesterday afternoon it was to find the current issue of HauntWorld waiting for me. Today I hunted down a copy of the Fear Finder at a local Kmart thus making it the earliest I have ever obtained a copy. Finally, tonight myself and some veteran haunters are getting a jump start on the season with a visit to the Scarefest Scream Park — a trip that will set a mark for the earliest we’ve ever visited a haunted attraction! The current mark has stood for nearly three years, it was set on September 25, 2009 when we ventured to Jackson’s Underworld and the Homer Mill in what will always be remembered as an abjectly disappointing night. We’ll hope for better tonight as we make the trek to New Haven where we’ll experience Scarefest Scream Park’s Castle of the Dead and Hayride of Doom. These discounted September previews can often leave a lot to be desired but we’ve also made some great haunt memories on such trips, so there is reason for optimism.